There are many things to know and do before planning any boating excursion. But, what should you know or do differently when it comes to boating through the Trent-Severn lock system? Here are five key tips that we should all know and checkoff our list before heading out on the waterway summer. The first thing you will need is your lock pass. We would recommend purchasing ahead of time online. 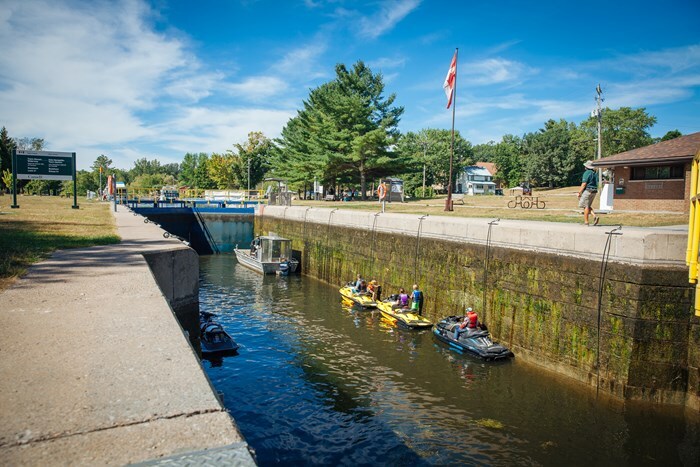 Every year early bird discounts are offered with a 20% discount off of a seasonal lockage permit and a 10% discount off the price of mooring until March 31st of that boating year. As well lock passes can also be sold to you at any lock while passing through. Lock passes are sold in a variety of options such as a one day pass, transit one way, six day or a seasonal lockage permit with or without mooring. With each permit there is a different fee based on the length of your vessel billing at a price per foot. You will need to be aware of the hours of operations for the locks as the daily hours change depending whether it is a weekday, weekend and the season – spring, summer or fall. You can research the hours online. Knowing the daily hours is important because depending on when you choose to travel the hours of operation will dictate how far you will be able to make it in a day. 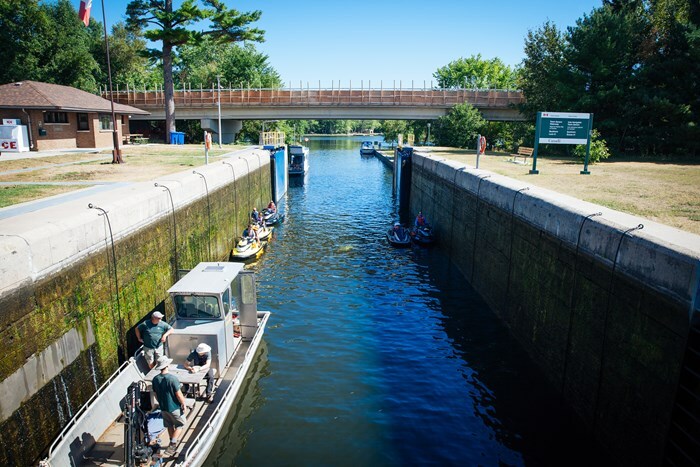 When it’s a beautiful day in the middle of the summer and especially on a weekend, lock traffic may be heavier and you may encounter longer wait times at each lock. We suggest taking your time, don’t be in a rush and plan your trip accordingly – you’re on the water after all, enjoy the journey. We have been through parts of the waterway system in an old houseboat and in speedboats, and there have been many times in the houseboat that you get to the next lock the speedboat that went speeding past you is sitting there waiting to pass through the lock. We believe The Trent-Severn Waterway is about smiles per hour and not miles per hour. Now that you know the hours of operation and have planned approximately how far you want to travel each day you can plan where you want to spend your nights. 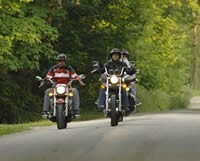 There are parts of the system that pass through cities like Peterborough and Orillia that offer hotel and bed-and-breakfast accommodations, and great waterfront restaurants. 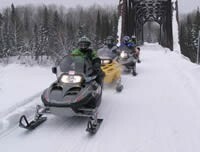 There are also cool boat access only spots like The Waubic – located between The Swift Rapids Lock 43 and The Big Chute Marine Railway Lock 44. The Waubic is a very popular family-owned destination for boaters offering delicious, high-quality food, friendly service, entertainment and activities for patrons with overnight dockage and power hook ups. 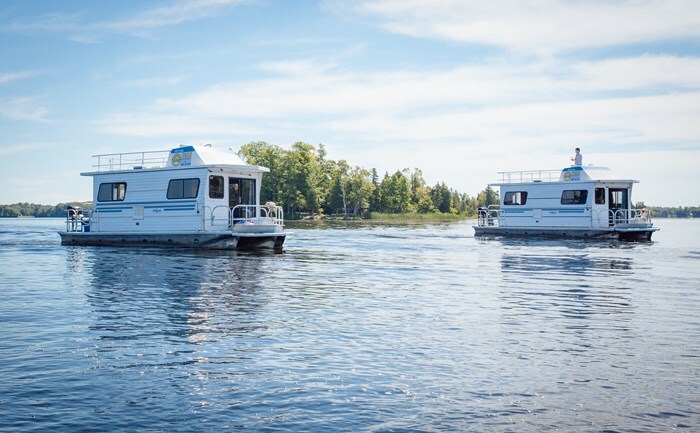 There are many spots to stop and anchor for the night along the way such as Big Chief Island in Orillia on Lake Couchiching or Lost Chanel Landing on the Severn River stretch of the Trent-Severn heading toward Georgian Bay. Another option is mooring overnight right at the lock. There are washroom facilities available at every lock through Trent-Severn system for boaters to use. There are many places and ways to spend your nights along the Trent-Severn so do your research ahead of your travels. With the technology of today there are many different options we can use to navigate the waterways through the Trent-Severn – from GPS, to Apple and Android apps, and good old-fashioned paper charts. Whatever way you choose to navigate is your own personal preference as each way works. Personally, we choose to use an app on our iPhones and iPad called 'Navionics. We have had this app for years, all the charts are always up to date and it tracks your location, speed, water depth and even your trip path. It is very handy, and we highly recommend it. And we also recommend not yelling at your navigator/captain as this only makes situations worse when trying to find your way. The entire Trent-Severn Waterway is very well marked with buoys and navigation markers. As long as you are following your navigational tools your trip will be relaxing and enjoyable. The length of your trip, number of passengers and size of your boat will dictate what you will need to bring – for example: food, water, clothing, etc. We would recommend trying to keep the boat as light as possible while bringing only what you will need. Gas is expensive on the water so might as well save it and not burn it by lugging around any unnecessary extra weight. Now to focus on more of the essentials – you should always have your boaters’ licence, fire extinguisher and other required safety equipment on board. Some other key thing you should have with you is a small but well-equipped tool box for those just-in-case moments or the little problems like a screw coming loose. A battery booster pack will provide extra comfort if the battery runs low after a night at anchor. A more ‘lock specific’ tool you should carry is at least one telescoping boat utility hook to help get you in and out of the locks safely and scratch-free as you can be very close to other boats when entering and exiting the locks. This will help you to safely grab the lock guidelines or push off from another boat. You should also have enough fenders for each side of your boat as sometimes you may be required to pull in the middle of a lock with boats on either side of you. 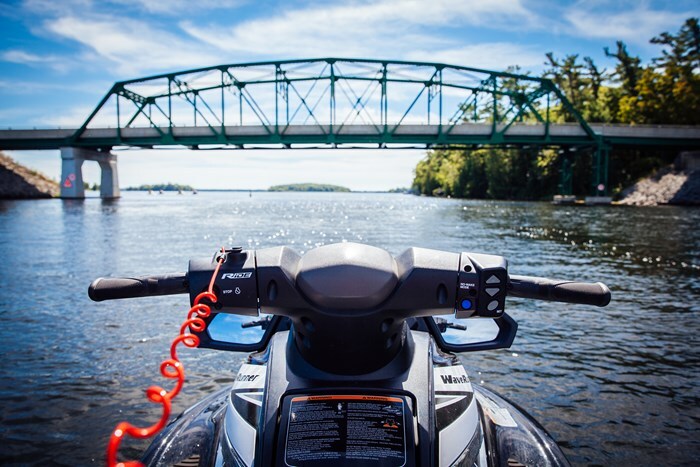 We hope these tips can help guide you with what you need to know before planning your trip on the Trent-Severn Waterway this summer. Happy boating and we will see you on The Trent-Severn!